Football fans prefer their old school Premier League football heroes than today’s current crop of names, according to a recent poll. When asked who would be their ideal goalkeepers, defenders, wingers and strikers in their five-a-side team, football fans put the likes of Beckham, Henry, Ronaldo, Gerrard, Schmeichel, Ferdinand and Terry over today’s footballing names including Salah, Kane, Aguero and Cech. 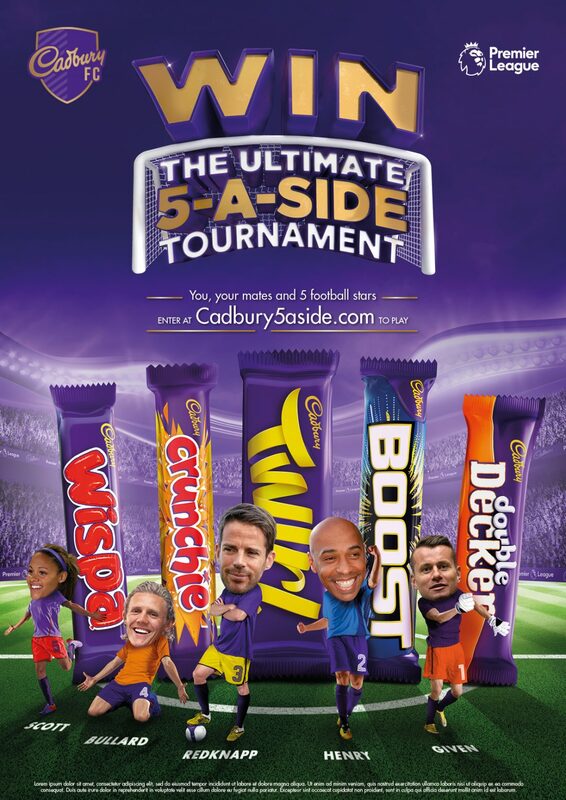 The research was carried out by Cadbury for its new “Ultimate 5-A-Side Tournament” promotion, which gives the public the chance to play with and against five football legends – Thierry Henry, Shay Given, Jamie Redknapp, Jimmy Bullard and Alex Scott. Jamie Redknapp, one of the Cadbury ambassadors and football legends, echoed this trend with a dream five a side team which includes legendary players from Liverpool and Arsenal, but not one current player. His dream five a side team includes former Arsenal goalkeeper David Seaman, and David’s fellow Arsenal team mate Tony Adams in defence. The former Anfield trio of John Barnes, Steven Gerrard and Robbie Fowler complete his dream line up. The research also revealed how much Brits love the five a side game and how it can be responsible for bringing people together and making new friends, because it’s so easy to join in and play – no matter your age and ability – simply grab a ball, some friends and head to the nearest park. In fact, those who play five-a-side said they like the game because anyone can play (49 per cent) and it brings work colleagues together (43 per cent). In addition, the average five-a-side player spends 68 minutes a week playing – with women playing 1 hour 10 minutes and men playing 1 hour 7 – that’s almost 2.5 days a year. Football fans can win the chance for themselves and five mates to play either with or against these legends by heading to the Cadbury5Aside.com website throughout May and registering any Cadbury chocolate single bar barcode to get a chance to win a spot in this ultimate tournament. Terms and conditions apply. Previous: Previous post: The World Cup underdogs: upset on the horizon?